For me, there’s not much that says “summer” more than peaches. When I was growing up, we would go visit my grandma every summer. And every summer she would have homemade peach jam waiting for us. My grandma is an amazing cook. She can take a little of this and a little of that and turn it into the best thing you’ve ever eaten. 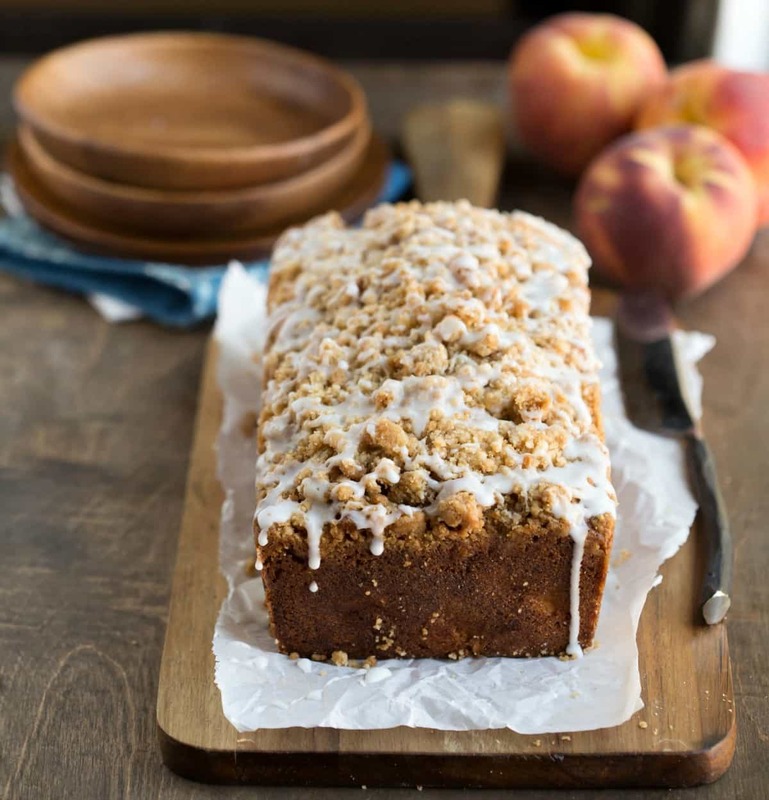 I’ve never been able to replicate her peach jam, so I have to stick with things like this Peach Cobbler Loaf Cake to get my peach fix. 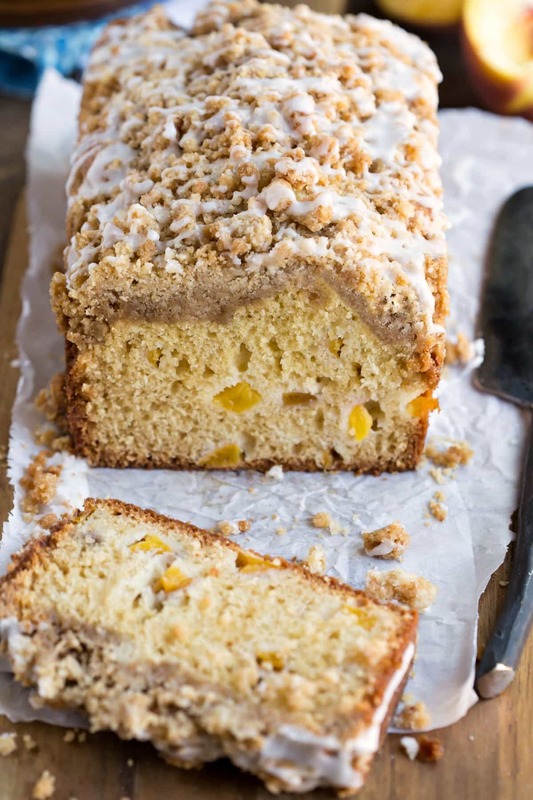 This cake is a tender, soft vanilla cake that has pieces of fresh peach throughout. 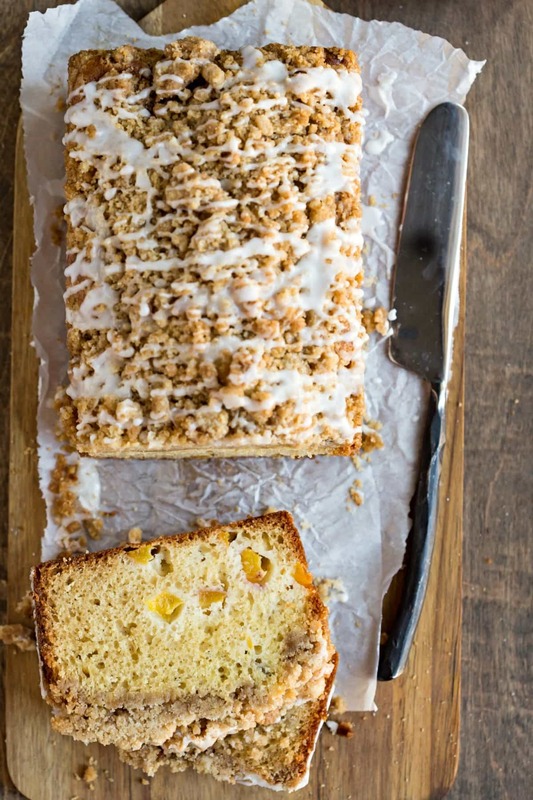 It’s topped with a sweet, brown sugar crumble topping and a drizzle of icing. 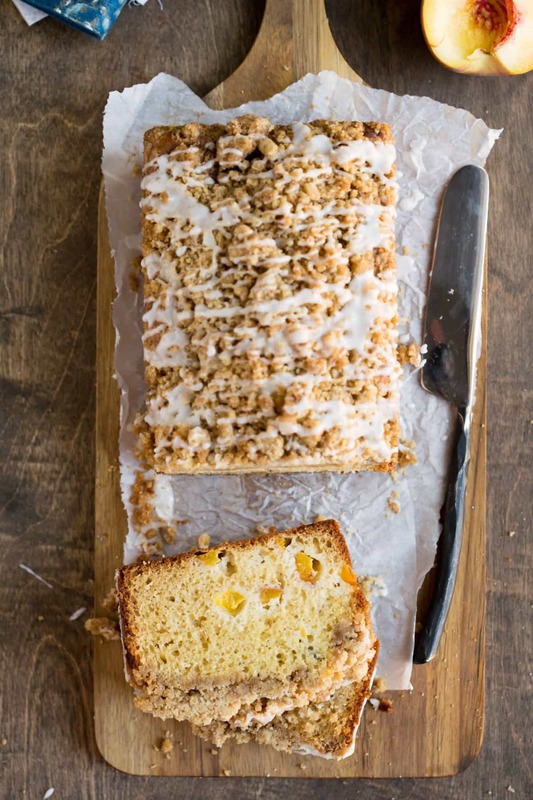 This Peach Cobbler Loaf Cake would be equally at home for breakfast (coffee cake!) or for dessert. 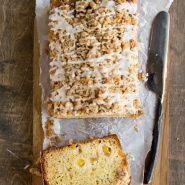 No matter when you enjoy it, this cake is a great way to enjoy a little bit of summery goodness! Preheat oven to 325 F. Grease a 9x5-inch loaf pan; set aside. In a medium bowl, stir flour, sugars, cinnamon, and nutmeg together. Pour in melted butter, and stir to combine. Set aside. In a separate medium bowl, whisk together flour, baking soda, baking powder, and salt. Set aside. In a large bowl, whisk vegetable oil, sour cream, buttermilk, and sugar together until combined. Whisk in eggs and vanilla extract until well-combined. Whisk in dry ingredients until combined. Bake for 50-65 minutes, or until a toothpick inserted into the center comes out clean. If topping begins to get too brown, tent with aluminum foil. Let loaf cool in pan for 10 minutes. Remove cake to wire cooling rack. Whisk powdered sugar and 2 tablespoons milk together. Add in additional milk as needed to get thick but pourable consistency. Drizzle icing over the top of cooled bread. Let icing set before slicing. Sorry about that! There was a glitch that changed the formatting on the recipe card, but I’ve fixed it now. If you have any other questions, please let me know! Do you think this would work with other fruit–blueberries come to mind, I have a lot right now. I do! I think blueberries, apples, etc., could work in this recipe.